I didn’t used to like tomatoes, but growing up with the One Bite Rule I was instilled at an early age with a standard of trying things repeatedly. And fortunately over the years I learned how wrong I was not to like tomatoes. So when I saw this Tomato Cobbler I thought it would be a wonderful way to highlight delicious summer tomatoes. This makes an awesome side dish, pair it with black bean burgers for a great vegetarian meal, or make some turkey meatloaf for a hearty omnivore meal. In a food processor, combine dry ingredients and pulse to combine. Add cold butter and shortening and pulse until crumbly then dump into a large bowl. Add cheese and buttermilk and mix with a fork until just combined (dough will be shaggy). Knead for about 10 minutes, shape into a disk and wrap in plastic wrap. Refrigerate while making the filling. In a large skillet, heat oil and butter over medium heat. Add onions and season with salt and pepper. Sauté until onions caramelize, about 15 minutes. Remove from heat and add balsamic vinegar. In a large bowl, toss tomatoes, basil, flour, red pepper flakes, salt and pepper. Add onions and toss. Preheat oven to 375°F. Grease an 8″x8″ baking dish and pour in the tomato onion mixture. Bake for about 25-30 minutes. While the tomatoes bake, roll out the dough to 3/4″ thickness. 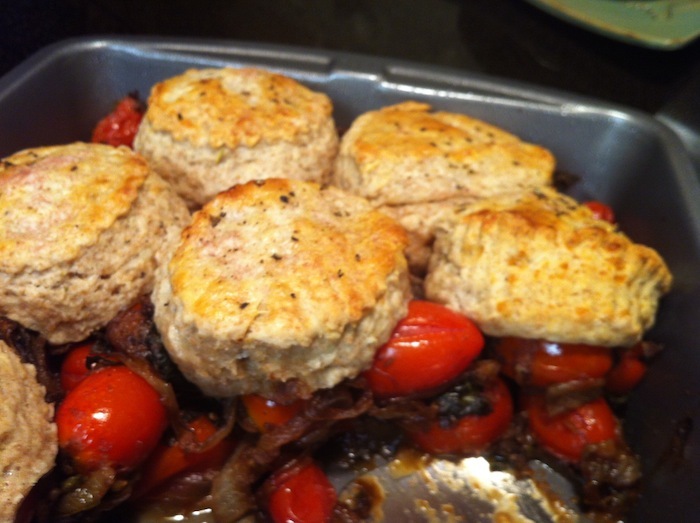 Using a 2″ biscuit cutter, cut out biscuits, reshape as necessary to get about 12 biscuits. 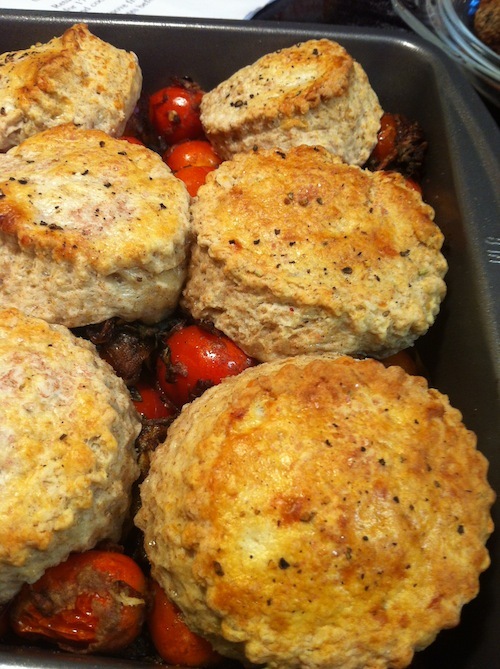 Once the tomatoes have cooked for about 30 minutes, carefully top with biscuits (6-8 should fit on top, freeze the rest or bake on a separate baking sheet). Lightly brush the tops of the biscuits with buttermilk. Return pan to the oven and bake for 17-20 minutes. Until biscuits are golden and tomatoes are bubbling. Let stand for 5 minutes before serving. This was really delicious! The combination of the tomatoes and the cartelized onions was quite tasty! Hope to make this again really soon!